Plant Description: Fennel is a hardy perennial which grows wild in most temperate areas in Europe, and indigenous to the shores of the Mediterranean. It is also cultivated in India, China, France, Russia, Persia, and Egypt for the medicinal use of its fruits, commonly called seeds. Fennel prefers to grow on bare ground in coastal areas. An umbelliferous herb, Fennel is a beautiful plant with thick, perennial root-stock, stout, erect and cylindrical stems that bright green and smooth as polished glass. 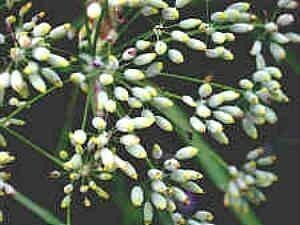 The stems are vertically-grooved and branched and smell of aniseed when crushed. Fennel has feathery leaves, and the bright yellow flowers, blooming from July to September, occur in four to 30 simple umbels in a compound umbel. The fruits are ovoid-oblong and ridged. The plant grows to 4-5 feet or more in height. Medicinal Properties & Uses: Fennel is a digestive soother. It is one of the safest and easiest digestive remedies. It calms an acidic stomach, the discomfort of acid reflux, and irritable bowel syndrome. It is used in the treatment of mild, spasmodic gastrointestinal complaints such as flatulence and indigestion, bloating and heartburn in adults, colic in infants, and people with sensitive stomachs. Fennel seed is used to alleviate gas pains and the discomfort from overeating, or from eating of rich, spicy, or heavy foods. Both the seeds and the root are appetite stimulants and sooth the digestion. The volatile oil has both carminative and spasmolytic actions, and has been shown to increase liver regeneration experimentally. Fennel also assists in settling upset stomachs caused by stress or anxiety. It is a useful remedy for upper respiratory catarrh and has a calming effect on bronchitis and coughs. It is also diuretic, and is used to treat urinary calculi. Fennel is also a well-known folk remedy that can help first-time mothers increase their milk production. Externally, the oil relieves muscular and rheumatic pains, and the infusion may be used as a compress to treat conjunctivitis and blepharitis. The seeds have a traditional reputation as an aid to weight loss and longevity.